This lamp has 444 pieces and ranks a 1 out of 5 on the difficulty scale. Odyssey Lamp Mold and Pattern for 18" Clematis Lamp: $180. This design requires a 3" wheel and ring set: $75. 18" Brass Bottom Rim: $18. The mold, pattern, wheel, ring and rim are all included in the total discounted price. 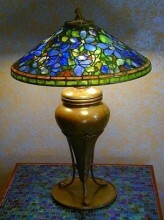 This kit does not include glass, base or other supplies for completing the lamp. Click the button below to add the 18" Clematis Lamp Kit to your wish list.